I love peanut butter, too. I’m not sure of the price today. It could be up or down. After all, as we know, just about everything at the supermarket goes on sale sooner or later. But I have a neat system. I call it my “per unit game.” It’s really a game and I love it. Familiar with it? No? Well, you should be. You’ll save lots of money. And you’ll have fun playing it, too. That is, if you like saving your pennies. I do. I insist on buying quality stuff, but at the best price. Pennies can add up to dollars fast. Not everybody feels my way. I know a lady who pays scant attention to prices. She just snatches whatever she wants and drops it in her cart. If peanut butter, maybe the most expensive. And that’s it. She enjoys playing bridge and Scrabble. But the per unit game? Nothing doing. Maybe you’re like her. Let’s use peanut butter as our first example today. Peanut butter is so popular. As usual, there are many choices. Which to buy? Now relax please. You can learn the per unit game in five minutes or so. The game is ultra-important because peanut butter comes in many brands. And each brand has several varieties. Creamy, nutty, with honey, and so on. It also comes in several sizes. Most have the standard everyday price. But every week some will go on sale. So if you don’t insist on a certain brand and want to economize, what’s the best buy for you today? The per unit game is the answer. Paying it every time you shop is so important that I’m going to repeat it: per unit pricing. Peanut butter! As usual, we are given many choices. Which should we buy? in California, where I live now, unit pricing is a state law. Most states have a similar law. Maybe all 50 now. Well, they do if they want to make sure their people get a fair deal. The per unit price tells you how much an item costs per ounce or per pound or per quart or per whatever it is measured. And it’s supposed to be posted near the item. BUT—please notice my emphasis—the unit price is the tiniest price on the sticker! Much smaller than the other prices. You may have to squint. Why is it the tiniest? Something in me believes management doesn’t want me and you to pay attention to it. But maybe I’m wrong. Ha! I’ve taken pictures for you. 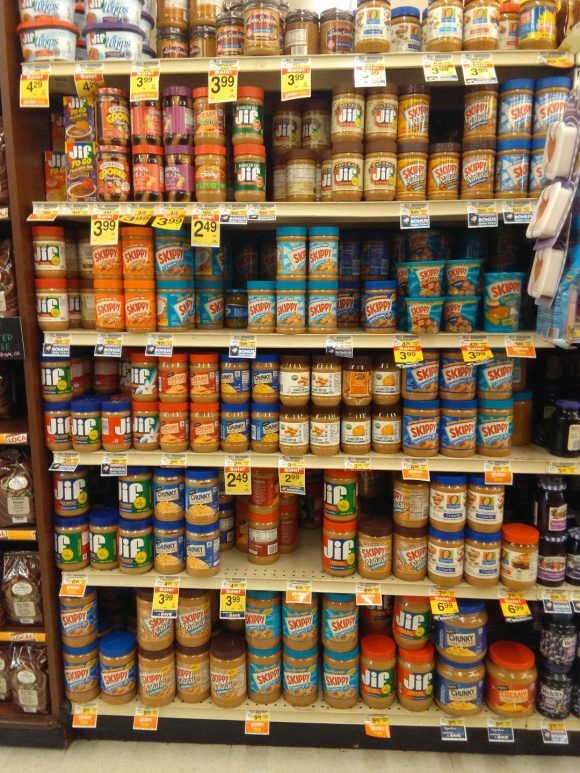 Look at the one of all the shelves of peanut butter. Some 100 different possibilities there. I counted 23 on sale. What’s your pleasure? Well, have fun choosing…. Now look at the second photo. It shows only two jars. Both on sale. Let’s assume you want the best buy. As the big numbers on the sticker show, one is normally $4.49 and is on sale for $3.99. So 50 cents less. It contains 18 ounces. It’s a mix of peanut butter and jelly. Now look close. Its normal unit price is 25 cents per ounce. So multiply that by 18, which is the price being advertised. 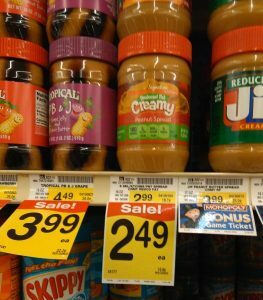 The other jar is $2.99 marked down to $2.49, so also 50 cents less. But it has 16 ounces. not 18. And no jelly.The normal unit price is 18.7 and the sale unit price 15.6, Not sensational. Still it’s a saving. You decide. Oh, you want to keep looking? Okay. As you see, there are others on sale, and in different sizes. Checking their unit prices will be the fastest and smartest way to go. Whether you’re checking different brands or sizes or ingredients. Neat, I think you’ll agree. Now check what I wrote and learn to play the per unit game. different products. If you choose the sorbet you’ll get more than if you will ice cream. 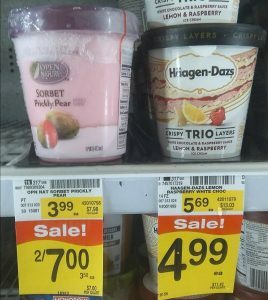 The sorbet is $3.99 per quart marked down to $3.50 but you must buy two. Its unit price is $7.98 cents reduced to #3.59. The ice cream’s unit price is $13.03 per quart reduced to $11.42. So the sorbet unit price is much cheaper. Now one more: Signature Diced Tomatoes. Look at the photo down below. Signature is the store’s house brand. House brands by and large are considered fine quality. Normal price of $1.49 on sale at 89 cents. Its normal unit price dropped from 10.3 cents per ounce to 6.2. This seems as good a bargain as you’ll find. You may want to take home several cans. Playing the game may sound trivial. But if you shop once a week and have a family, you can go home with extra dollars. At year’s end you will have saved enough for a bigger and better TV set or a splurge weekend at a luxery hotel. As you can tell, I enjoy the game. And know what? Now just about everything I buy is on sale. Yes, indeed. I rarely have to pay the full price. Sure, it’s taken me time to reach this stage. At first, whenever I spotted a good buy in peanut butter, as one example, I’d buy not one but three or four jars. And so on. And I did that with one item after another. Now I have a closet filled with my bargains and can choose from a wide variety. Which of course translates to more freedom in planning my next meal. By the way, it’s good to have extra food in storage. You never know when some catastrophe might strike and leave stores closed for days. 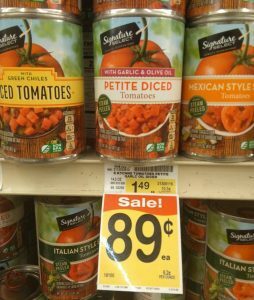 The unit prices tell us these Signature diced tomatoes are one of the better buys. Some items rarely go on sale. At my chain supermarket here, bananas, for instance. For a long time they were 69 cents a pound (10 cents more for organic). a few weeks ago, the price jumped from 69 to 79. Bananas are a big seller. Many customers buy bananas regularly. I always have bananas on hand. Sales must have plummeted. I say this because the store in a very short time dropped the price right back down to 69. That was a smart PR move. It takes just a few small things like that to drive good customers to a competing store. Of course I read it. And checking unit pricing is not one of those top secrets! I check unit pricing every time I shop. An awful omission. Incredible. It should have been Secret Number 1! And that’s how I got inspired to write this for you. Well, the strategy for a chain supermarket’s sales is a very interesting topic but I must save it for another day. Heck, I’ll tell you a thing or two about that right now. Of course, as you may be aware, big chain supermarkets are sophisticated. Smart. Efficient. Know what they’re doing. That’s why so successful. night. Then prices jump back up to normal. True for the hundreds of stores in the chain, I believe. Week after week. And on the next Wednesday, the store will open with a new list of items on sale, again for exactly seven days. And that will be the strategy all through the year. Staging these sales requires enormous planning and hard work. Somebody at headquarters decides what will go on sale and at what prices. Much of that decision results from product availability. For produce, different harvest seasons. Produce not only from our country but from Mexico (a lot) and Costa Rica (bananas and other produce) and Hawaii (pineapples and other ) and Canada (many products with maple syrup as a small example) and Portugal (olives and other) and so on. And at holidays, customers expect big sale items. Christmas, Thanksgiving, Fourth of July, and so on. For sure every store will have to be supplied with additional inventory because more people will buy. The sale prices have to be set. All these sale items with new prices will have to get printed up for newspaper ads and their website and the thousands of flyers they have to have ready for customers to study. Well, on Tuesday at midnight, with the staff gone home and all customers locked out, an expert crew will come in and get started. They will have to rip off all the old sale prices–a big job in itself– and post the new ones–another big job. Some aisles are six to eight shelves high. To apply the new prices, the workers will have to reach high and squat low. Hard work. And get it all finished before the store opens in the early a.m.
Not many of us customers realize that. We have little idea how much work all this involves and how costly it is. But the chains do it for good reason, of course. Customers want bargains! The bargains keep us coming back. Many are itching to know what the sale items and their prices will be. And the chain is praying that the volume of sale items scooped up will make up for the reduced prices and all this work. And here’s something else you may not know. Many manufacturers and distributors of these various products pay the stores for better positioning. Ever notice what gets placed on the shelves that we face at the beginning and end of every aisle? Well, chances are that the chain is collecting “rent” for those. Even getting paid extra to place items at eye level on those shelves. Why? Because that’s where many customers do most of their picking. Well, to get back to peanut butter, I wasn’t sure what the best deals would be this week. Now I know. But I’m going to pass. I still have three jars at home. But there’s one more thing I must do. I must write to Reader’s Digest and point out their awful goof! How they didn’t list unit pricing in their top 40 Supermarket Secrets. It should have been Number 1! I hope I get a reply. If I do, I’ll let you know. Again I look forward to your comments, good and not so good. I do enjoy them. By the way, some of you send me comments that are a delight. Thank you. I tip my hat to you.